History: Ellie just couldn’t summon the energy or will to race like some of her siblings. 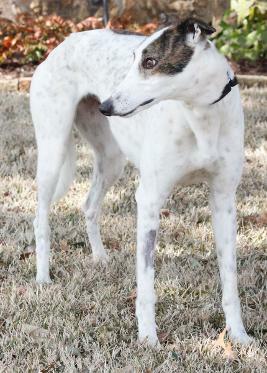 (Her sister, Lazy and Crazy, is available for adoption through GPA Houston.) Therefore, Ellie was not officially registered with the NGA. But that doesn’t stop her from racing to her retirement sofa. Her sire, Snow Blower, is from the Kiowa Sweet Trey line and her dam, Head Em East, is from the Dodgem By Design line. No wonder she’s such a cutie. Ellie may be a little hesitant when she meets new people but we are sure she will warm up once she is used to being in a home environment. Ellie with her new family including fur-brother, Boss. 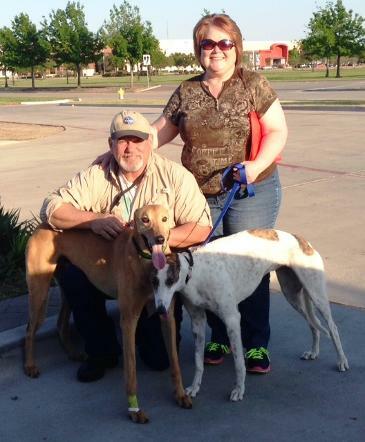 April 18, 2014 update: Ellie is adopted and has a new Greyhound brother. Congrats to all. April 1, 2014 update: Ellie was returned to TAGS after living in a home for almost two months. 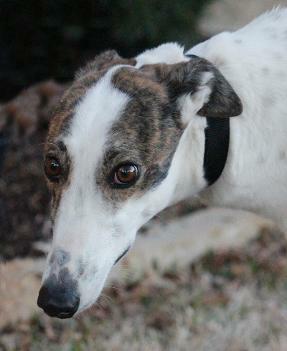 Ellie is unsure of herself in new situations and is still learning to live in a home environment. She needs someone to help her gain confidence. She would do best with other dogs in the home to help her feel more secure. 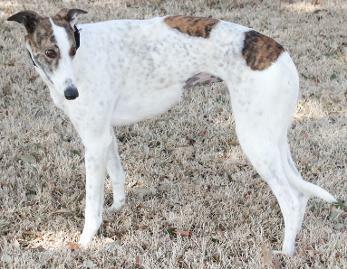 She needs a family with the time and patience to help her acclimate to her environment in her own time. 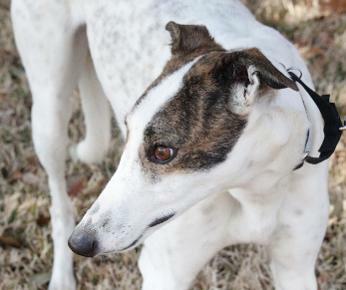 Ellie is very affectionate and wants to be with people. Helping her develop her confidence will make her your friend for life. February 9, 2014 update: Ellie, now Minnie, found her lifetime home with TAGS girl, Shady. Congrats to all! January 20, 2014 update: Ellie came to TAGS to find her loving lifetime home.